I found her use of the German sixth to pivot between Db major and F minor rather original. I also used, in addition to Rachmaninoff’s First Piano Sonata slow movement, the intro to the slow movement of his Third Piano Concerto. I find Rachmaninoff’s harmony subtle and quite innovative; he’s not all all the disher-up of Romantic clichés pictured in the academic imagination. As usual, the general academic view of nearly everyone is short-sighted. I agree. I was once at a meeting about electroacoustic music and I dared to disagree with an academic and intellectual. He wagged his finger at me – as if I were a stupid badly behaved 5 year old – and stated that if I had studied this particular electronic work that he had composed I would understand and not ask such a misinformed question. The harmony is beautiful and interesting but I can’t find the German 6th. Where is it? KG replies: Oh, they’re later in the piece, sorry. But I also found notable the added-sixth sonorities that run through the piece from the opening measures. The Smyth slow movement is lovely. Sometimes (perhaps most of the time), I’m glad I don’t have to worry myself about whether a piece of music I find beautiful and satisfying is cliche’d or not in academic terms. 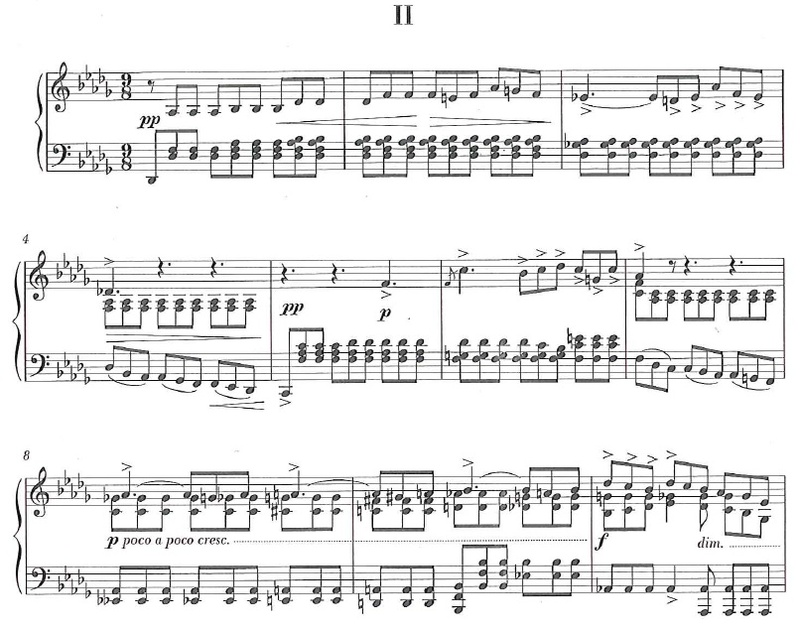 There is so much beautiful Rachmaninov it seems a shame that anyone would turn his/her nose up and put students (or anyone) off listening to it. Someone asked me not long ago why I liked the Symphonic Dances so much, as the person asking would like to be “convinced.” I was sorry, and at the same time glad, I had no technical information to serve up. Listening, it seemed to me, should be convincing enough. I have the thought that there’s something else at play, too, particularly when it comes to 19th C music, and it is that if music has an emotional pull, it is suspect. KG replies: I believe that I am unusual among composers in how immersed I have been in 19th-c. music, and in how much it has influenced my own – mostly as pertains to harmonic structure, and yet without considering myself a neoromantic.